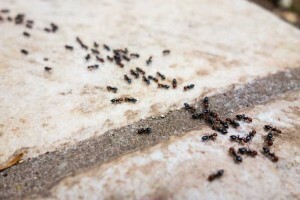 When you think of ants, the first thing that might come to mind is the trail of black insects running across your baseboards to a piece of dropped food. These small insects look quite harmless, but can actually damage your home if you have an infestation. Did you know there are more than 12,000 ant species across the world? That is a lot of different types of ants. Each have their own unique habits. For example, crazy ants are a species that you do not want making their way into your house. Should you have a colony move in, you will be in need of a crazy ant exterminator Jacksonville. This species of ant is known to exhibit frantic and erratic behavior. They dart about in unusual ways. These ants can be brown or black in color and only 3 mm in size. These insects live in warmer climates, particularly down south from Florida to Texas. When cold weather hits, these insects will be more likely to rush into your home. While they are able to withstand wet and dry climates, extreme cold kills them. Why Do I Need Crazy Ant Control Service? For such a tiny insect, they can destroy parts of your home, because of the enormous number of colony members. They can be quite destructive when they infest your house. The last thing you want are ants camping out near your electrical wiring or electronics. These insects can destroy the wires. They have even been known to cause fires after shorting out electrical wires. Not only do these bugs come in seeking refuge in unusual spots, they have a pheromone that they put off to let others in the colony know they have found a new place in your home to nest. It isn’t just a few ants that you will need to worry about, rather a swarm that finds their way into your home. When you have a group of bugs invading your home, it’s best to have a crazy ant exterminator in Jacksonville. Who Offers Crazy Ant Control Service? Bug-Man is a crazy ant exterminator in Jacksonville. With our experience and expertise in the field, we offer the best in crazy ant control service and other pest control. When it comes to eliminating these pesky ants, we will treat the inside your home as well as outside. Since they are known to forage far from their nest to find food, we will find the places that they are most likely to be and treat those areas as well. It is our job to make sure that you do not deal with these insects any longer. If you have any questions about crazy ant removal in Jacksonville, please contact us today. We are standing by and ready to help you take back control of your property.